The US must stop using its only South American military base for anti-drug flights when its lease expires in 2009, the Ecuadorean government has said. Ecuadorean officials said they had now formally notified the US that an accord under which the US military uses the Manta air base would not be renewed. 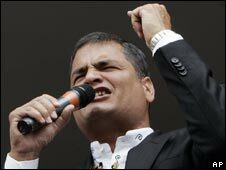 President Rafael Correa has long spoken out against the agreement. Flights from Manta are responsible for some 60% of drug seizures in the eastern Pacific, US officials say. A statement from the Ecuadorean foreign ministry said the US ambassador in Quito had been informed of the decision not to renew the lease. Surveillance flights would end in August 2009 and the withdrawal of foreign personnel would be concluded by November of that year, the statement said. The US and Ecuador signed the 10-year agreement on 12 November, 1999. Some 300 US personnel are stationed at Manta in western Ecuador, from US Air Force and Us Navy aircraft conduct surveillance flights. The base has clear strategic value for the US military but Washington has previously said it will respect Ecuador's decision. US military officials have said there are no plans to set up an alternative base in neighbouring Colombia or Peru. There have been concerns among some Ecuadoreans that operations from Manta have not just targeted the illegal drugs trade but have aided the Colombian government's fight against left-wing guerrillas, says BBC Mundo's Andean correspondent Carlos Chirinos. A draft of Ecuador's new constitution, backed by President Correa and approved by the Constituent Assembly, prohibits the presence of foreign bases on Ecuadorean soil. The text will be put to a national referendum on 28 September.